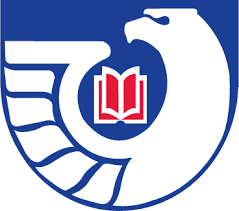 The University of Detroit Mercy houses a collection of federal government documents in print, microfiche, and tangible electronic format (CD-ROMs and DVDs). It also provides access to titles available online through the Government Printing Office (GPO). These resources are available not only to students, faculty, staff, and administrators of the University, but also by federal law to anyone else who may wish to consult them. The University has the distinction of having been a selective depository library since 1884. A selective depository is not required to collect, or provide online access to, every single document published by the federal government, but tailors its collection according to the needs of its users. There are, however, regional depository libraries throughout the United States mandated to do just that. Besides maintaining as comprehensive a collection as possible within their own four walls, these regional depositories “oversee” selective depositories in each state to ensure that an adequate number of copies (or adequate online access to) documents and other government information in a given geographic area. The University of Minnesota is currently the regional depository for all selective depository libraries in Michigan as well as those in Minnesota and South Dakota. Included in the University’s depository print and microfiche collection are Census files from 1960 through 1990; publications from the National Library of Medicine going back several decades; and publications from NASA dating back to the early days of the space program. The print documents that the University has available in tangible format and classified in SuDoc are housed in the electric compact shelving that faces east in the lower level. CD-ROMs and DVDs are in a set of drawers immediately south of that shelving. Microfiche is kept in several filing cabinets along the south and southwest walls, behind the electric compact shelving for books and serials classified under H.
Depository libraries have the flexibility of classifying government documents under a different classification system to allow for greater accessibility. Many of the print documents that are part of the University’s depository collection are classified with Library of Congress numbers and shelved among other titles with those numbers. If you have any questions about the University’s government documents collection; or need help locating a government resource; you may contact Kris McLonis by phone (313-578-0457) or email (mclonika@udmercy.edu). Published by the American Theological Library Association, the ATLA Religion Database with ATLA Serials is the premier index to journal articles, book reviews, and collections of essays in all fields of religion. Most journal coverage starts from 1949 and, for others, starts as far back as the nineteenth century. ATLA contains 1,776 journal titles representing scholarship in the major religions, faiths and denominations. Subject areas include Bible, archaeology, and antiquities; human culture and society; church history, missions, and ecumenism; pastoral ministry; world religions and religious studies; theology, philosophy, and ethics. To access ATLA Religion, go to the library portal page, research.udmercy.edu . Click on the third tab, Articles, Journals + Databases. Under Find databases by title, select the letter A. Scroll down to the bottom. ATLA Religion is second to last on the list. A useful feature of this database is the Scriptures tool which takes the guesswork out of how to look up Bible chapters and verses. Click on the Scriptures heading to open a browsable list of the books of the Bible in canonical order from Genesis through Revelation. Click any of the books to open a list of all the citations and articles about that book. Click [Expand] to narrow your search to certain chapters of the book you are interested in. Click [Expand] again to narrow your search to the verses. Another option for locating articles on particular scripture passages is the Scripture Citation index under the Indexes heading. 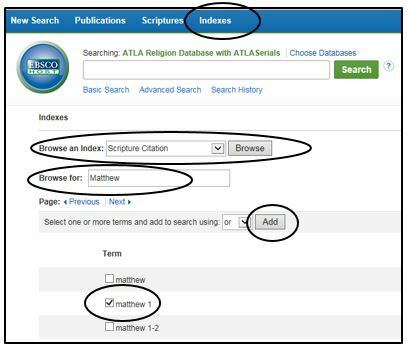 Click on Indexes in the heading and select Scripture Citation in the Browse an Index box. Enter the name of the book of the Bible you need in the Browse for box. Click Browse and a list of chapters from that book of the bible appears. Place a check mark in the box next to the chapter(s) you are interested in. Click Add and then Search to obtain all the articles and citations on that bible chapter. Take it on faith. ATLA Religion Database with ATLA Serials is your best source for research on religion. Contact a librarian for further information. Using the UDM Library catalog can be a frustrating experience when it works too well and retrieves thousands of matches for your search. That’s why there are so many different tools and tricks for refining your search, and why librarians are experts at focusing your search to retrieve a manageable list of results. But the reverse problem often occurs as well. You know darn well that book is in the catalog somewhere. You found it before. Where is it now? Leaving aside the remote possibilities that the book has been withdrawn from the collection, there are a number of other things that can go wrong. Ironically, these often happen out of good motives. For example, limiting the scope of your search is generally helpful. But let’s say you generally spend your free time at the McNichols Campus Library (and who doesn’t? ), and have gotten used to always limiting your searches to materials held there. By doing so, you are automatically excluding all electronic books from your search results, since the catalog does not recognize them as part of the McNichols collection. Search limits should be treated like antibiotics and used if they are necessary, not just because they are there. Misspellings are an obvious cause of empty search results, and there are constant reminders to check your spelling, usually in the voice of your first grade teacher. But sometimes just plain spelling gets you in trouble. If you try a keyword search, there are just six results. Very good, except that none match. Now, I’m sure about half of you are totally frustrated. The other half entered the title as Health Care Marketing Plans, found the book with no trouble and are halfway through it. Yes, it makes a difference whether you enter “health care” or “healthcare”. Or pairs like “labor / labour”, “color / colour”, “counselling / counseling”, and so on. The computer is unfailingly literal, and the exact word or phrase must appear in the catalog entry before it winds up in your search results. The bad news is that you have to remember this stuff. The good news is that you don’t have to do two searches every time you’re looking for a health care / healthcare topic. The Power search option is made for this problem, since part of the search can link the two variant forms with an “OR”, ensuring either will be retrieved. Yes, at times searching the catalog is like being “IT” in a never-ending game of Hide-and-Go-Seek. But if the material is there, you can find it with a little thought, a little luck, and a helpful librarian. Hard to believe, but there once was a time when you could visit the corner newspaper stand and find daily (sometimes twice daily) newspapers from the immediate vicinity as well as national and even international publications providing different perspectives on important events and people. Well, the good ‘ole days aren’t completely gone thanks to the MeL Database InfoTrac Newsstand. USA Today are some of the titles included. Helpful tools will allow you to generate citations for articles in multiple formats (e.g. MLA, APA), listen to articles, and translate articles into different languages. If your searches are getting too many results, the convenient Topic Finder tool will help you focus your search. InfoTrac Newsstand is a one-stop source for current news and searchable archived news. Keep InfoTrac Newsstand in mind the next time you are looking for the world view as covered in the press. Some text used with permission from Eunice Borelli and Deb Biggs Thomas, Michigan eLibrary, Library of Michigan. I’ll bet you think a library catalog is nothing but a list of selected materials available through the Library. Well, you’re kind of right. That’s the basic purpose of a library catalog. But there’s more to it than that. You see, the library catalog is sort of like the LinkedIn for information. Each entry is for a specific book or journal or DVD or whatever else the library owns. You can glean more detail about it than you might ever need to know. But as LinkedIn provides links to other professionals in the field forming a network, so does the catalog by providing links to additional resources. Let’s say that you are in the happy position of having a specific book to search for. (This is called “known item searching”, but let that pass for now.) You go to the Re:Search portal at http://research.udmercy.edu , click the Books/ebooks + DVDs tab, and key in the title Emerging Perspectives On Substance Misuse. This takes you to a page that gives a description and additional information about the book. Why that happens is something for another blog post (got to give you a teaser for next time). What matters to you right now is that the title of your “known item” appears at the top of the page. In this example, the book is an electronic book so there’s a button you can click to read the book online. That was easy. These are more formally called Subject headings. Each links to a large number of books which relate to the same subject as your known item. 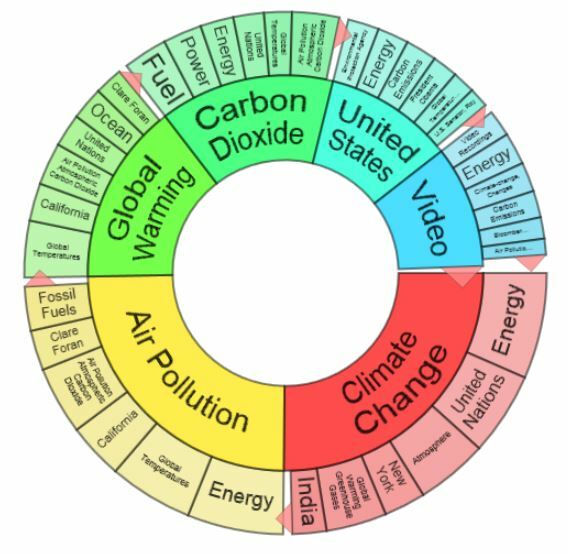 This helps you find additional relevant information on your topic. Subject headings are particularly important because all books on the same subjects have the same subject headings. If, for instance, you were to search for “substance misuse”, which is not a listed subject, you would get only a fraction of the information available had you used the subject heading links such as Substance Abuse. That’s what library catalogs are about these days, providing instant links to related information. So now you know. And you’ve also learned what “known item searching” is. Impress your friends. They may even think you’re a librarian. It’s grueling, tedious and time-consuming. I’m referring to typing research papers and getting the in-text citations right and then typing the bibliography at the end with all that confusing formatting. Well, not anymore. UDM Libraries has a tool that makes the formatting of your citations oh so easy and its called RefWorks. This week, Thursday, October 23, Librarian Sue Homant will be offering a drop-in workshop on RefWorks here in the library from 12:45-2:00. RefWorks can be a powerful tool when you are doing a research paper. Here is just a taste of what RefWorks can do. Using Refworks begins with signing up for a new account. Go to the library portal page research.udmercy.edu. Click on the third tab, Articles, Journals + Databases. Under Find databases by title, you will see the alphabet listed. Select the letter R. RefWorks is second on the list. Click into it and click . As you do your research and find articles in the library databases, use the export feature found in most databases to load the citations into your RefWorks account. It is also possible to attach the articles to the citations in RefWorks When you have completed your research, make sure all the citations of the articles you will be using in your paper have been loaded into RefWorks. When you are ready to begin typing your paper, go into your RefWorks account, click on Tools and download Write-N-Cite 4. Upon successful completion of the download, you should see this at the top of the screen in Microsoft Word. Click on RefWorks then click on Log In and enter your RefWorks account and password. You will also enter UDM’s Group Code, which can be obtained from the Research and Information Desk. 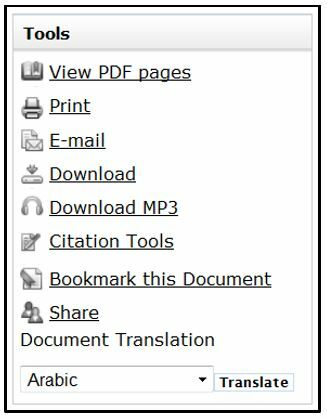 While typing your paper, click on the Insert Citation icon and select a citation each time you want to cite a source within the text of the paper . Continue typing and entering the citations as you go by clicking on the Insert Citation icon. RefWorks will put the citation in the text of the paper in the format style you selected. When you have finished typing your paper and have entered all the citations within the body of the paper you will be ready for RefWorks to create your bibliography page. Place your cursor where you want the bibliography to begin. Click on Bibliography Options. Then click Insert Bibliography. Your bibliography will be created in the format style you selected. What would take you hours to do RefWorks does instantly! Drop by Thursday and learn how to make citing fast and easy. You may have noticed, or will notice in the coming weeks, that the PsycINFO database has a different look to it. Indeed it does. The library is now providing PsycINFO through ProQuest rather than Ebsco. From the library homepage, research.udmercy.edu, click on the third tab, Article, Journals + Databases. 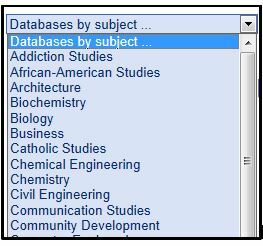 Under Find databases by title, select the letter P. Scroll down until you find PsycINFO 1887 (third from the bottom). By clicking on it, the basic search screen will come up. You may enter your search term here. If you need scholarly articles and/or peer reviewed articles click in the boxes. If you have multiple search terms, click on Advanced search. When you do your searches, you may notice that you are getting little full-text. Searching PsycINFO by itself will not yield full-text articles. To expand your search to include full-text, click on the gold arrow at the top where it says Searching: 1 database. Select ProQuest Psychology Journals and PsycARTICLES. Now you will be searching three databases and the option for full-text will appear. An easy way to search all three Proquest Psychology databases is from the Article, Journals + Databases tab, under Find databases by title, select the letter P. Instead of selecting PsycINFO 1887, select ProQuest Psychology Databases. That option will automatically allow you to search PsycINFO, PsycARTICLES, and ProQuest Psychology Journals at one time. The Advanced search option allows you to search with multiple terms. You can limit your results by Publication date, Source type (e.g. magazines, newspapers), Document type (e.g. Conference paper, report, review) and Language. Explore the new PsycINFO and see how it can work for you. As always, please contact the library if you have questions about this database or any of the library databases. The Diagnostic and Statistical Manual of Mental Disorders, 5th Edition (DSM-5) was published by the American Psychiatric Association in May 2013 and serves as the standard for classifying and diagnosing mental disorders. It supersedes the DSM-IV-TR. The DSM-5 “is intended to be applicable in a wide array of contexts and used by clinicians and researchers of many different orientations (e.g., biological, psychodynamic, cognitive, behavioral, interpersonal, family/systems). The DSM-5 has been designed for use across clinical settings (inpatient, outpatient, partial hospital, consultation-liaison, clinic, private practice, and primary care), with community populations. It can be used by a wide range of health and mental health professionals, including psychiatrists and other physicians, psychologists, social workers, nurses, occupational and rehabilitation therapists, and counselors.” (www.psych.org/practice/dsm) The current edition is the result of over 10 years of work by international experts in all aspects of mental health. 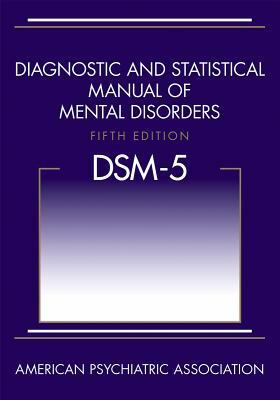 You can find a copy of the DSM-5 at the Library Research and Information Desk. Why would you want to use Academic OneFile? It is an excellent database to begin your research because not only does it contain peer-reviewed, scholarly articles on multiple subjects such as the physical sciences, technology, medicine, social sciences, the arts, theology, literature and more, but has magazine and newspaper articles as well including the New York Times (1985-present). Academic OneFile has the content you need no matter what topic you have chosen for your research paper and it has many features that you will find useful as you look for articles. To access Academic OneFile, go to the library portal page, research.udmercy.edu . Click on the third tab, Article, Journals + Databases. Under Find databases by title, select the letter A. Academic OneFile is third on the list. Click and enter your search terms. For example, suppose you are looking for articles about Facebook. Enter Facebook as your search term. If you need scholarly articles, you may limit your search to peer-reviewed. Academic OneFile defaults to full-text. Your results will appear down the center of the screen. 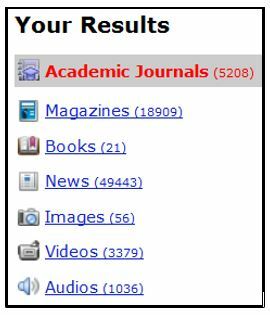 On the left side you can choose from academic journals, magazines, books, newspapers, images, videos or audio files. When you click the title of one of the articles in your results list, the text of the article appears. There is a Listen feature so you can hear the article rather than read it. You will see on the right side, a box labeled Tools. You can View the PDF version of the article, email the article, or download an MP3 of the article. You can also translate the article into another language. Academic OneFile also has an option called Citation Tools. By clicking on it, the MLA and APA citation styles of the article opens up. You may copy and paste the citation into the Works Cited page of your research paper or you can download the citation first and then copy and paste it. You also have the option of exporting the citation into a citation manager such as EndNote or RefWorks. So there you have it! The content you need and the features to make your research easier all wrapped up in one package, Academic One File.